You hear it over and over again: “drink more water.” It's no secret H2O is vital to any living thing’s survival, but the numerous benefits are often ignored or taken for granted. Most of us don’t think to drink water until we’re feeling thirsty. However, we shouldn’t even be allowing ourselves to get to that point because thirst is synonymous with dehydration. If you’re an avid outdoorsman, water may be even more important. Hunting and fishing can be vigorous activities, causing you to burn calories and expend energy. Let’s face it, carrying a hunting pack or large tackle box can be a workout in itself. Add in physical activity, and we can assure you water will be your best friend. Many different factors play a role in how much water you should consume during a hunting or fishing expedition. It’s important to consider how rigorous your outing is, the length of the trip, weather conditions, and your body. Even though water can be heavy, it is the last provision you want to skimp on. The weight may be uncomfortable at first, but remember … the more you drink, the more energy you’ll have … AND the lighter your pack will become. If you scour the internet for how much water you should consume in a day, you’ll notice there are a lot of varying opinions out there. The popular opinion is two liters on any average day – an amount that should allow your body to stay hydrated and maintain all crucial bodily functions. A long hunt or fishing trip is not considered “your average day.” We recommend nearly doubling that amount if embarking on a rugged journey. A water bottle is an investment. Spend a little extra money on a quality vessel that will retain your drink’s ideal temperature. You’ll be a lot happier sipping from it, and it will last a lot longer. Since there are endless options, we’ve narrowed it down to the best of the best. Put a few of these bad boys in your pack with a water purification system, and you’ll be ready to power through whatever the day brings! We've tested Klean Kanteen’s tumblers and were more than satisfied, so we couldn’t resist putting some of their water bottles to the test for this roundup. First up is their Insulated Classic 20oz. 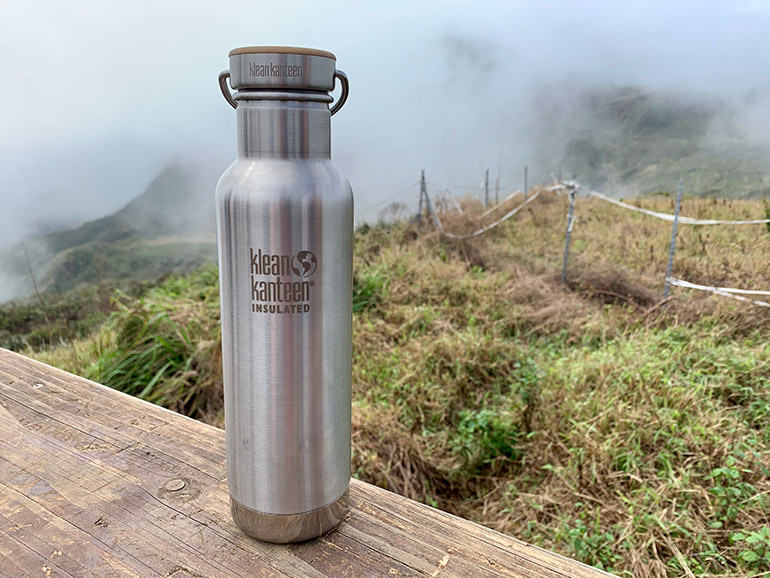 This bottle is made with Klean Kanteen’s renowned Klean Coat – a durable, chip-resistant finish, safe for both people and planet. Its double-wall vacuum insulation will keep contents hot for up to 20 hours and cold for over two days if you start with some ice in there. It comes with their loop cap, but you can always purchase the compatible Sport Cap 3.0 for one-handed drinking. This stellar classic is offered in all the colors of the rainbow, so pick your favorite and hydrate away! Next we tested the sleek and stylish Insulated Reflect 20oz. The consensus is that this bottle is both beautiful and highly functional. The look and feel of the Reflect screams sustainable. It is 100-percent plastic-free and made with only three materials – bamboo, stainless steel and food-grade silicone. Unlike the Klean Kanteen Insulated Classic, this product is recommended for cold products only due to the bamboo and stainless-steel cap. Electropolished interior, a safe & non-toxic process, and rounded corners make them easy to clean. Another favorite water bottle of ours is the Yeti Rambler. 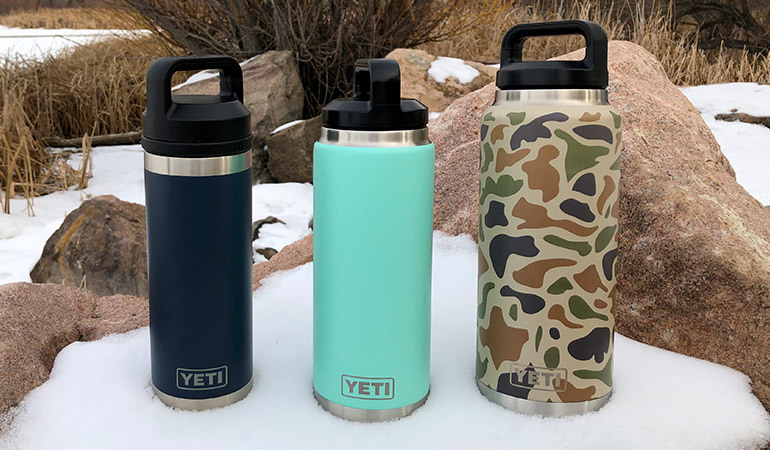 Much like other Yeti products, these bottles are designed to conquer the outdoors and excel in durability and functionality. We are confident you won’t find a line of water bottles more prepared for that extreme backcountry hunt than the Rambler! 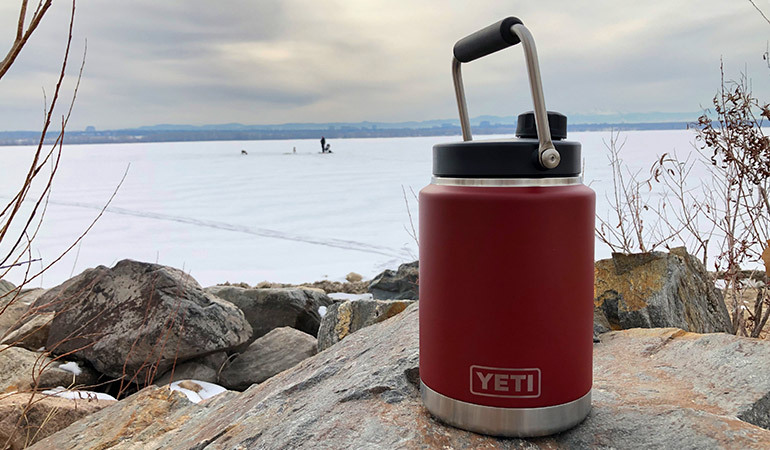 The stainless-steel Rambler is one tough thermos – it’s puncture-, corrosion- and rust-resistant. Don’t be afraid to toss a Rambler Bottle in your pick-up truck because the Rambler can take a beating and will not leak or sweat. Even the Rambler’s DuraCoat (powder coated) color will hold up to daily use in the field. The colors won’t chip, crack or fade. We love to fill our Rambler Bottles with high-quality H20, but you can use them to keep any beverage hot or cold. They are double-wall vacuum insulated and do an amazing job of keeping liquid at its ideal temperature. You won’t get a metallic taste from these bottles either. You know those large, 2-inch ice cubes used in swanky craft cocktails? Those rocks fit into the Rambler no problem. The mouth of the Rambler is extra wide, a unique feature you don’t often find with other bottles. Its broad opening makes for easy filling, cleaning and guzzling like there’s no tomorrow. If you prefer to sip on a smaller opening, we recommend getting the Bottle Chug Cap accessory. With the Bottle Chug Cap, you can easily sneak in a quick drink of cold water in between drills at the shooting range. The Grizzly Grip Bottle is yet another amazing option for hunters and anglers. Made of rust-resistant stainless steel and with double-wall vacuum insulation, these bottles are strong and will keep water ice cold (or hot) all day. When you have a Grizzly Grip Bottle full of refreshing water by your side, a full day of adventure is inevitable. With a price tag ranging from $19.99 to $29.99, you wouldn’t think this bottle could get any sweeter, but it does! 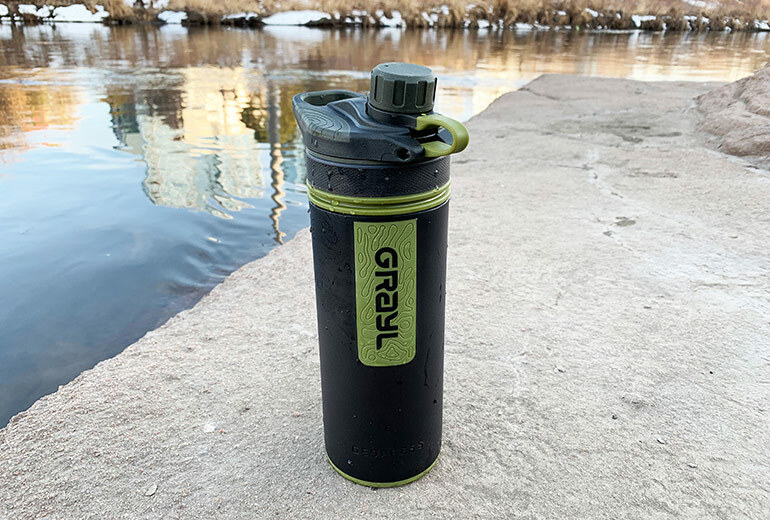 In addition to the Grizzly Grip Bottle’s strength and ability to maintain liquid temps, there are three other notable features worth mentioning: its gripping qualities, screw-on cap, and slip-resistant bottom. The bottle’s signature grip design – four finger grooves on each side – makes it easy and comfortable hold. You can also grasp the handle on the cap with your hand for easy carry. Opening and closing the bottle is effortless due to its screw-on cap. The cap screws on tight to prevent leakage, and guess what? You can’t lose it! The cap is attached to the bottle by a strap, so there’s no way to accidently misplace or drop it when out in the wilderness. The third feature we want to highlight on the Grizzly Grip Bottle is its non-slip base. The rubberized pad on the base of the bottle ensures your drink stays in one place – which means you can set it down on the boat table or cooler while at sea and it will stay put when waves gently rock the boat. What if an unexpected rogue wave happens to crash at you, you ask? Well, let’s just say you have more to worry about than the bottle sliding or tipping over. Venturing somewhere with running water? You can drastically lighten your load by packing iodine tablets or a water filtration system from LifeStraw or GRAYL. Products like these allow you to transform dirty and unclean water into purified and safe-to-drink H2O. If you choose to go the tablet or filter route, it is also important to make sure you have a quality water bottle – one that you love, thus encouraging you to stay hydrated. We tested two of LifeStraw’s products, the original LifeStraw and the LifeStraw Go. These two hot commodities look incredibly different, but both serve the same purpose – to make bacteria-ridden, contaminated water safe to drink. The original LifeStraw is an 8-inch long plastic tube with a mouthpiece for drinking on one end and a filter screen on the other. The filter's longevity is impressive considering you can pass 1,000 gallons through it before the pores become too clogged to function effectively. That is enough water to last you five years. To use the original LifeStraw, start by uncapping both ends. Then put the wide, screened side of the straw filter directly into a freshwater source, such as a lake or stream. The first few sips may require some effort, but it won’t be long before you’re chugging clean natural water and thirst becomes a thing of the past. 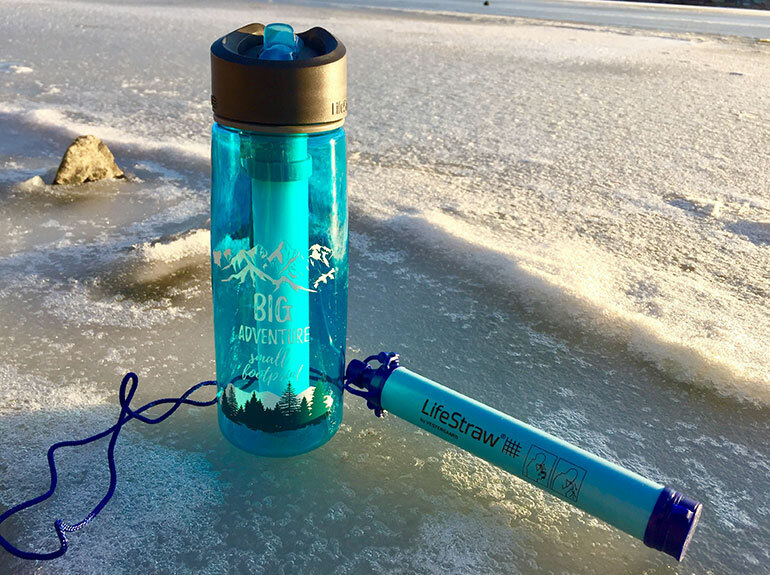 The LifeStraw Go takes the LifeStraw to new heights by sticking the original LifeStraw we all know and love into a bottle. So you know that lake water you gratefully stumbled upon when you were starting to feel a little dehydrated? Now you can scoop some up into the LifeStraw Go so you don't have to bend over and drink directly from the source itself. Both the LifeStraw and LifeStraw Go are essential products for the outdoorsman. As long as you are near fresh water, these items will literally take substantial weight off your shoulders. Don’t cut your hunting or fishing trip short because of the weight of water provisions if you don’t have to. Most people will tell you that you shouldn’t drink the water from the South Platte River which runs directly through the city of Denver … but guess what?! We DID and it tasted like clean tap water with the new GRAYL GEOPRESS! Of course, we wouldn’t recommend doing this with just any water purification system. Ordinary pump and straw filters use size exclusion to separate unwanted materials from water and aren’t capable of removing the tiniest waterborne microbes: viruses. The GEOPRESS, however, does remove viruses, including rotovirus, norovirus, and hepatitis A. The GEOPRESS has three components: the cap, the inner filtration tube, and the outer tube. To get yourself some safe H2O, pull the inner tube out of the outer tube. Scoop some water into the outer tube, then press the inner tube back into the outer tube. Unscrew the cap’s lid a little so there is somewhere for the air to escape. It takes a little effort to press, but we’d prefer it that way because you can feel the GEOPRESS working its magic! Taking the first sip of that dirty city water was a little unsettling, and we got a few judgmental looks from passersby, but the cold Colorado water was super hydrating. We recommend taking this purifier on freshwater fishing trips to transform any lake or river into an infinite drinking water resource. If you’re travelling, it is also great to purify the water from hotel faucets. The GEOPRESS will be available for purchase in April 2019 with the following color options: Alpine White, Camo Black, Coyote Amber and Visibility Orange. If you can’t wait until then, the Ultralight Purifier model will do the same job. If you’re on the hunt for a heavy-duty pack that can carry water in addition to gear and other supplies, look no further than the Blackhawk! Titan Hydration Pack. The Titan is the perfect water wingman with its substantial 100-ounce reservoir and attached drinking hose, so you can sip while you step. It’s ideal for weekend-long trips because of its capacity and comfort. The 2800-cubic-inch pack provides more than adequate space for all the belongings and provisions you should need for a 2-day adventure. Hunting on foot with the Titan is as comfortable as any larger pack can get. The frame is incredibly sturdy and built with a tight 3-D mesh back panel, allowing for space between your back and the pack. Its adjustable two waist belts (one hip and one lower torso) help protect your back by placing a good portion of the weight on your hips. Everyone who purchases this pack agrees it’s worth the money due to its robust construction, reservoir system and spacious capacity. 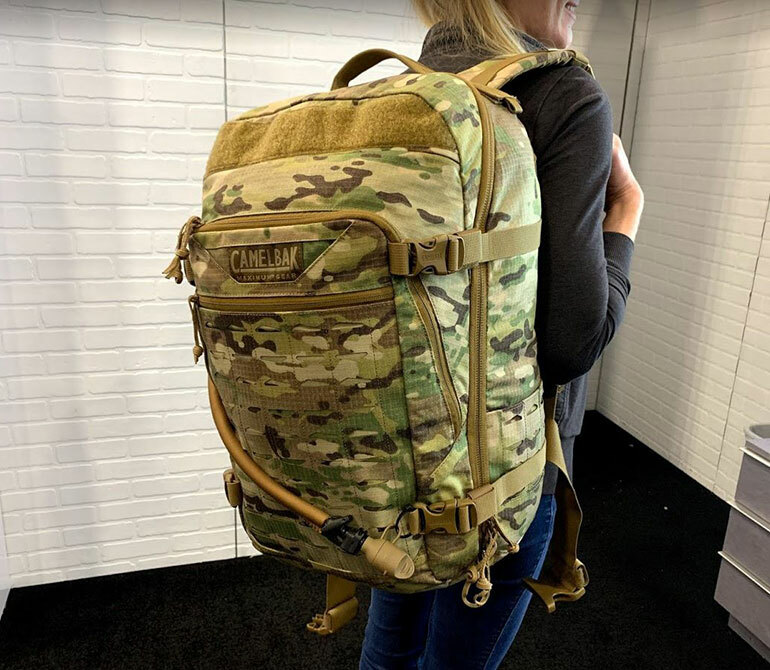 CamelBak has always been a brand epitomized for their hydration products, so when they came out with a hunting line this year we were bouncing off the walls with excitement. Before even putting it to the test, it was love at first sight. 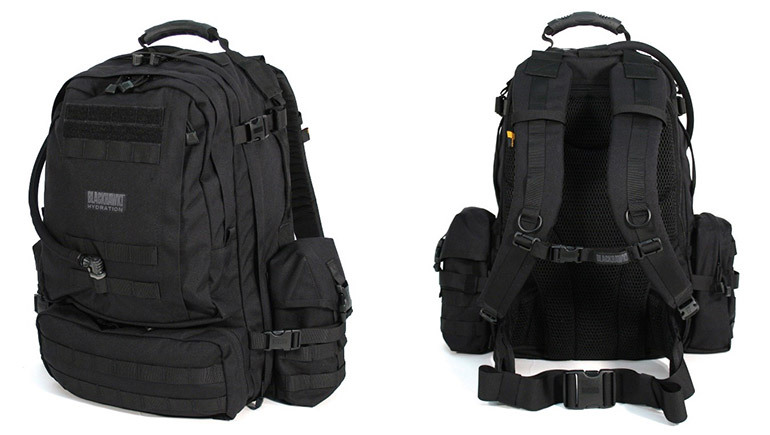 The backpack’s camouflage appearance and robust functionality is truly one-of-a-kind. So … what does “BFM” stand for, you ask? Well, “B” is for “Big,” “F” is for (we’ll let you guess), and “M” is for “Motherlode.” That’s right, it’s one B-F-M of a pack! It’s an amped up, larger version of CamelBak’s Motherlode with 13 liters more capacity than its smaller counterpart, making it ideal for longer missions. Another important BFM feature is its inclusion of the Mil Spec Crux Reservoir. 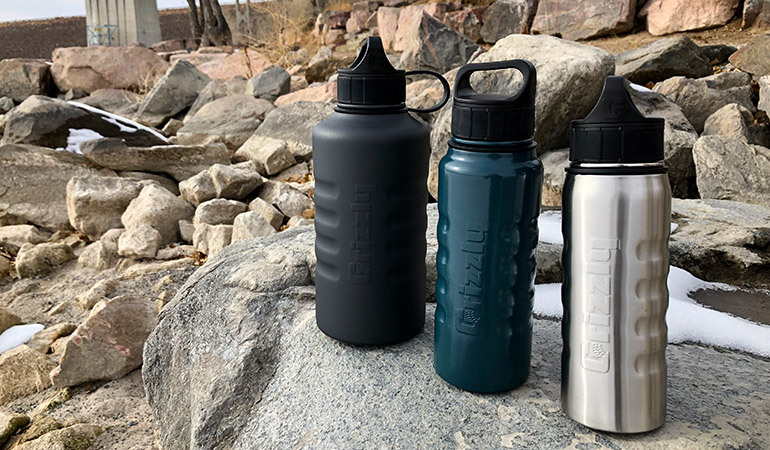 The new Crux system delivers 25-percent more water per sip than the brand’s original design, allowing you to stay as hydrated and focused as possible. The insulated and leakproof drinking tube includes a lever that lets you shut off or turn on the water source with one hand. In addition, the reservoir’s wide opening makes it easy to clean and fill. Water bottles, water filtration systems, and hydration packs are great H2O vessels for individual daily use, but what if you need A LOT of water for an outdoor activity? For instance, let’s say you’ve been put on water duty at camp and are responsible for hydrating the whole hunting crew. How do you plan to provide water for everyone? You could buy a few cases of plastic water bottles, but those have a negative impact on the environment and you’ll have to deal with the waste. Instead, consider using a portable water cooler or heavy-duty water jug for the job. Large water coolers and jugs are a convenient way to store and dispense clean drinking water, plus they are more environmentally friendly than disposable bottles. Most coolers and jugs are capable of holding gallons of liquid too, whereas an average plastic water bottle only holds around 16 ounces. An ideal water cooler for hunters and anglers needs to be tough, and it doesn’t get much tougher than the Silo 6G by Yeti. 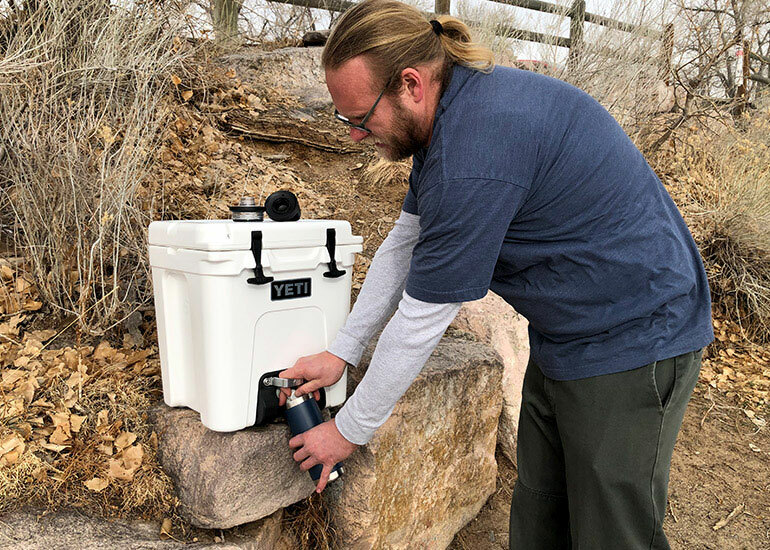 Designed with the same rotomolded construction and superior insulation as the Tundra, this cooler is built to last and will keep an ample amount of ice-cold water at the ready. Did you know dehydration can affect your mood? When we aren’t properly hydrated, we can become irritated and have trouble thinking clearly. Because hydrated campers are happy campers, it’s a good idea to promote water consumption at camp whenever possible. Setting up a hydration station using the Silo 6G water cooler is a simple an effective way to encourage others to drink more water. When water is readily available, people are more likely to drink it. The Silo’s spigot dispenses water quickly and is removable for easy cleaning. Yeti offers a whole bunch of great accessories for the Silo 6G, but two items in particular are worth noting for outdoorsmen on the go: the Tundra Tie-Down Kit and Silo Mount. Both of these accessories can be used to secure the cooler to a flat surface, such as a boat deck, side-by-side or truck bed. Once the cooler is affixed to your surface of choice, you can speed across the lake or off-road down the trail at 60 mph without worrying about the Silo 6G moving or sliding. With a Silo 6G, you’ll have plenty of cold water – up to six gallons – on demand, whenever and wherever you need it.